MANILA, Philippines – The 'June 2017 Environmental Planner board exam results', together with the list of passers, top 10 examinees, top performing schools and related announcements are available at this website as PRC officially released the results online two (2) working days after the last day of board examination. As announced, 739 out of 1,739 examinees passed the exams. The licensure exams are administered by PRC Board of Environmental Planning headed by its Chairman, Josefina M. Ramos and its members, Lirio T. Abuyuan and Dolores A. Endriga on June 7-8, 2017 at PRC testing centers in Manila, Baguio, Cagayan de Oro, Cebu, Davao, Iloilo, Legazpi, Lucena, Pagadian and Tacloban. The schedule of online appointment for issuance of Professional ID and Certificate of Registration will be from June 29-30, 2017. Registration requirements: duly accomplished Oath Form, Notice of Admission (NOA), two (2) pieces of colored passport ID picture with white background and nametag, two (2) sets of doc stamps. According to the Commission’s Resolution No. 2016-1019 series of 2016 entitled “Schedule of Licensure Examination for Year 2017”, the target release date of June 2017 Environmental Planner result will be in two (2) working days after the last day of board examinations or by June 13, 2017 (Tuesday). However, results may also be released earlier or later without prior notice. On the same exams conducted by PRC on June 2016, results were released after two (2) working days. On June 2015 and June 2014, results were out after three (3) working days working days. The two-days Environmental Planning board exams for June 2016 covered important topics from Environmental Planning Processes, Techniques and Strategies; History, Concepts, Theories and Principles of Environmental Planning; and Environmental Plan Implementation, Legal Aspects and Administration. On June 2015 ENVP exams, 178 out of 357 examinees passed. Due to low turnout of examinees, none qualified in the top performing schools. Meanwhile, Cid Leandro Miranda Jacobo from Ateneo de Manila University - Quezon City topped the exams having 80.05%. Meanwhile, below is the statistical table of ENVP examinees, total number of passers and overall passing rate in the last five (5) years, courtesy of PRC. 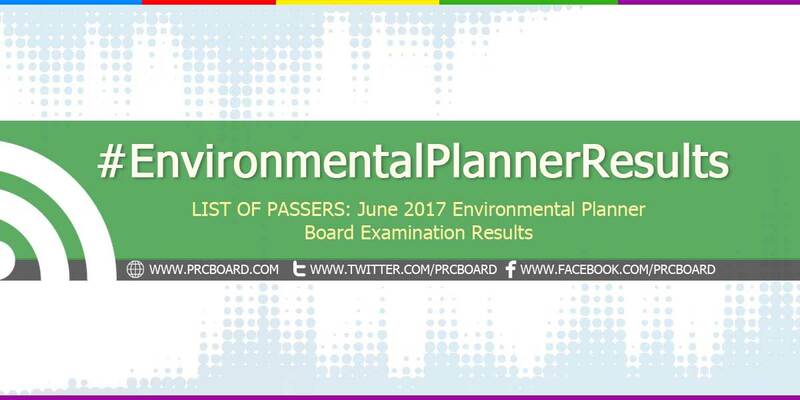 To receive up-to-date news about June 2017 Environmental Planning board exam results, we advise our visitors to bookmark this page, visit PRC official website or follow us at our social media pages via Facebook and Twitter.